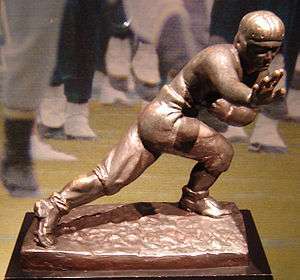 The Heisman Trophy in American college football shows a player anticipating delivering a stiff-arm fend. The stiff-arm fend (known as a hand off or fend off in rugby league and rugby union and sometimes as a don't argue in Australia or a stiff arm in American football) is a tactic employed by the ball-carrier in many forms of contact football. Fend by Edwin Maka during a rugby union game. In rugby league, rugby union, American football and Australian football, ball-carriers run towards defenders who are attempting to tackle them. By positioning the ball securely in one arm, the ball-carrier can fully extend his other arm, locking his elbow, and outstretching his palm. Then, the ball-carrier pushes directly outwards with the palm of his hand onto the chest or shoulder of the would-be tackler. The fend is a pushing action, rather than a striking action. A stiff-arm fend may cause the tackler to fall to the ground, taking him out of the play. Even if the tackler keeps his feet, it becomes impossible for him to complete a tackle, as he cannot come close enough to wrap his arms around the ball-carrier. A well-executed stiff-arm fend can be a very powerful offensive weapon. The term don't argue was coined in Australia to describe the stiff-arm fend. The term describes what a commentator imagined the ball-carrier might be saying as he shoved his opponent in the face or chest, and is used as a noun. Ball-carriers in Australian football must be careful to avoid fending opponents in the head or neck, otherwise they will concede a high tackle free kick. 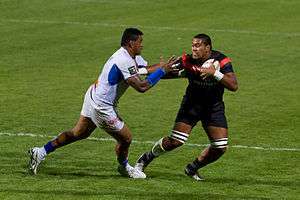 High fends will generally be allowed in rugby unless the referee rules that the fend is too forceful, constituting a strike rather than a push. In Rugby, a stiff-arm tackle (i.e. locked elbow and extended arm prior to making contact with the defender) is dangerous play. A player makes a stiff arm tackle when using a stiff-arm to strike an opponent (Laws of the Game, Rugby Union, Law 10.4, dangerous Play and Misconduct, Section (e), dangerous tackling). Therefore, a stiff-arm fend, as described above is permitted (even a high fend) so long as it does not constitute striking the opponent (similar to an open handed punch). The stiff arm is also known as "pie in the face" in NFL slang. Some famous players who use the fend include dual rugby/league international Sonny Bill Williams. The stiff-arm fend is particularly effective because its force is applied down the length of a straight arm, directly into the shoulder. This puts the arm bones exclusively under compressive axial stress, the stress to which bone is strongest, and ensures that minimal torque is applied to the shoulder joint. As such, the force that can be applied by a stiff-arm fend can easily repel or topple an oncoming defender. The same techniques are practised by some schools of martial artists when striking or punching; by ensuring that the direction of the force is directly down a locked, straight arm, martial artists can punch through bricks and tiles without damaging their arms. ↑ "Sonny Bill's fend in good form". AAP. 1 January 2009. Retrieved 15 February 2015. ↑ John Mitchell (4 December 2014). "Why Sonny Bill Williams is king of the offload". ESPN. Retrieved 15 February 2015. ↑ Will Greenwood (7 November 2014). "Will Greenwood believes Kyle Eastmond will hold his own against Sonny Bill Williams". Sky Sports. Retrieved 15 February 2015. ↑ Benji Marshall (22 July 2012). "Taking a punt on super-freakish Sonny Bill worth the risk". Brisbane Times. Retrieved 15 February 2015. Wikimedia Commons has media related to Stiff-arm fends.